Monte d'Accoddi is a Neolithic archaeological site in northern Sardinia, located in the territory of Sassari near Porto Torres. The site consists of a massive raised stone platform thought to have been an altar. It was constructed by the Ozieri culture or earlier, with the oldest parts dated to around c. 4,000-3,650 BCE. The site was discovered in 1954 in a field owned by the Segni family. The original structure was built by the Ozieri culture or earlier c. 4,000-3,650 BCE and has a base of 27 m by 27 m and probably reached a height of 5.5 m. It culminated in a platform of about 12.5 m by 7.2 m, accessible via a ramp. No chambers or entrances to the mound have been found, leading to the presumption it was an altar, a temple or a step pyramid. It may have also served an observational function, as its square plan is coordinated with the cardinal points of the compass. The initial Ozieri structure was abandoned or destroyed around 3000 BCE, with traces of fire found in the archeological evidence. Around 2800 BCE the remains of the original structure were completely covered with a layered mixture of earth and stone, and large blocks of limestone were then applied to establish a second platform, truncated by a step pyramid (36 m x 29 m, about 10 m in height), accessible by means of a second ramp, 42 m long, built over the older one. This second temple resembles contemporary Mesopotamian ziggurats, and is attributed to the Abealzu-Filigosa culture. Archeological excavations from the chalcolithic Abealzu-Filigosa layers indicate the Monte d'Accoddi was used for animal sacrifice, with the remains of sheep, cattle, and swine recovered in near equal proportions. It is among the earliest known sacrificial sites in Western Europe, providing insight into the development of ritual in prehistoric society, and earning it a designation as "the most singular cultic monument in the early Western Mediterranean." The site appears to have been abandoned again around 1800 BCE, at the onset of the Nuragic age. The surroundings of the Monte d'Accoddi have been excavated in the 1960s, and have provided the signs of a considerable sacred center. Near the south-eastern corner of the monument there is a dolmen, and across the ramp stands a considerable menhir, one of several standing stones which was formerly found in the vicinity. The foundations of several small structures (possibly residential) were excavated, and several mysterious carved stones. The most impressive of these is a large boulder carved into the shape of an egg and then cut through on a subtle curving three-dimensional line. The monument was partially reconstructed during the 1980s. It is open to the public and accessible by the old route of SS131 highway, near the hamlet of Ottava. It is 20 km from Sassari and 45 km from Alghero. There is no public transportation to the site. The opening times vary throughout the year. Ercole Contu, Monte d´Accoddi (Sassari). Problematiche di studio e di ricerca di un singolare monumento preistorico, Oxford 1984. S. Tinè, S. Bafico, T. Mannoni, 'Monte d'Accoddi e la Cultura di Ozieri', in La Cultura di Ozieri: problematiche e nuove acquisizioni, Ozieri 1989, pp. 19–36. ^ Ercole Contu. "L'altare preistorico di Monte d'Acoddi" (PDF). Sardegnacultura.it. p. 14. Archived from the original (PDF) on 2006-09-01. Retrieved 2015-04-25. ^ "Monte d'Accoddi and the end of the Neolithic in Sardinia (Italy)" (PDF). Arheologija.ff.uni.lj.si. Archived from the original (PDF) on 2016-03-04. Retrieved 2015-04-25. ^ Ercole Contu (2000). L'altare preistorico di Monte d'Accoddi. C. Delfino. ISBN 978-88-7138-206-7. ^ a b Jones O'Day, Sharyn; Van Neer, Wim; Ervynck, Anton (2004). Behaviour Behind Bones: The Zooarchaeology of Ritual, Religion, Status and Identity. Oxbow Books. pp. 35–41. ISBN 1-84217-113-5. ^ Dyson, Stephen L.; Rowland, Robert J. (2007). 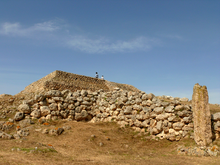 Archaeology and History in Sardinia from the Stone Age to the Middle Ages. University of Pennsylvania Museum of Archaeology and Anthropology. pp. 35–41. ISBN 978-1934536-02-5. ^ "Monte D'Accoddi: where in Italy you'll feel like you're in Mesopotamia". 203 Challenges. This page was last edited on 26 February 2019, at 10:06 (UTC).